Yusuf Islam has released a new peace anthem using the voices of hundreds of fans from across the world. 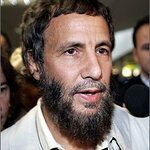 Yusuf – formerly known as Cat Stevens – invited people to send samples of them singing parts of his new song, My People, and the results have been put together for the final product. In 2009, Yusuf used Bono's (RED) to urge people to help children, and later that year recorded a song by George Harrison to help refugees in Gaza. He has served as an ambassador for UNICEF, and founded a charity called Small Kindness in 2000 to help needy children and families around the world. The song can be downloaded for free from his official website.